Note: I would excitedly receive feedback, commentary or other input from Cashmore Inc.
FWGR: Do the trees work? On this hole, I think they do. There are two viable lines to choose from. The highly unlikely third line is a perfect angle in from left of the left tree. There is more room out there than looks from the above pic, but OOB is close by and this avenue is far narrower than any other. Those playing from over there have likely toe-hooked it! The obvious middle line asks players to either take on the trees with accuracy, or to play a shorter club closer to the line of the left tree than the right. In doing this, the left tree can be all or partially in the line without affecting a normal shot, which would be played well over it. If the longer club is chosen, the risk of being close to either tree and having it affect the next shot is apparent (much like how the tree plays at Harbour Town #16). The third line not obvious from the photos is right of the right tree. The very light rough is very wide and accommodating, and indeed I’ve seen as many play from right of the right side tree as I have left of it (partially through miscue as much as design, though not entirely). The lie is reasonable but not as good as from the fairway, and the angle at the green is poor. A closer look from further along the drive line at the two tiered green and surrounds that faces the golfer from the middle line. The green is a diabolical little one, which serves this medium-short length par four well. Any shot not struck into a good position will encounter a difficult remaining passage, as the green complex doesn’t offer much to any player without a clear shot from a relatively central or left of central angle. The firmness of the green and pinched narrowness of the front half of it make judgement and execution requirements beyond most players from any considerable angle. The tier accentuates this by being on an unhelpful line of play, leaving only the back half of the green with enough width for a slightly more forgiving receptiveness. Even so, the camber down from the back to front of this green makes putting treacherous from well above the hole. In a way. I have described the hole above as almost being unfair to the average golfer or anyone not on a specific line, who still is in need of hitting the green in regulation. But in reality, players of all abilities are hitting this green in two from time to time. It is just that some of them are not as aware as others about why they often aren’t on in two, because the hole’s tests I’ve listed are insidious and clip the player over the ear without them being given a big wake up call. Which I think is a clever way of maintaining a hold on the more regular player. Having played the hole only 4 hours ago with a friend who also understands good design, I still think the answer is “no”. We stood on this tee for about 5 mins discussing the virtues of having the trees in the fairway a fairway and could not see any merit with it. For my thinking, at least 1 tree requires removal to make the hole a very good one, that being the tree on right hand. To our astonishment, there is another crypus tree planted next to the existing one. The tree impedes the sight of the green from the tee, this is no tragedy but on a flat, straight away hole should be a given. 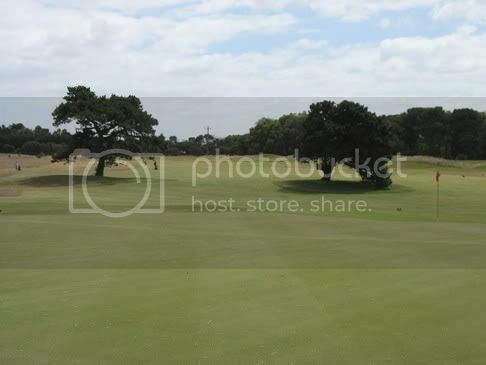 As mentioned, the best line to the green is from the left hand side, taking the tree from the left would make the hole easier for the bigger hitter to get the better angle. If the right hand tree were removed, the bigger hitter could sit hit driver but face a more touchy shot over bunkers to the (correctly named) diabolical green. I just think that a very good green complex deserves a better strategic fairway to play from, and trees should frame a hole, not dictate it. Lets forget this hole and make my response here more general. Why? I see any formula which says one must see the green on a flat straight hole as a far greater impediment to potentially good design than a defender of it. I think that thought is indefensible. Thank heavens many of the world's top 50-100 courses ignore this suggestion. Removing the left tree may make the hole better than removing the right one. It would reward the player who takes the riskier line left nearer OOB, regardless of whether they hit the ball a long way or not. The tree on the right could interfere with anyone who takes a far too safe route off the tee away from the trouble, and regardless of whether the tree interfered or not, would give them a more demanding second shot and angle as a result. And I can't agree with your thought that a tree can frame a hole but not dictate strategy. Nearly all the great architects in history strongly disagree with you there. In the instance of this one particular hole, I think it can be fun, and presents its challenges openly from the tee (including seeing the green and its angle of play). 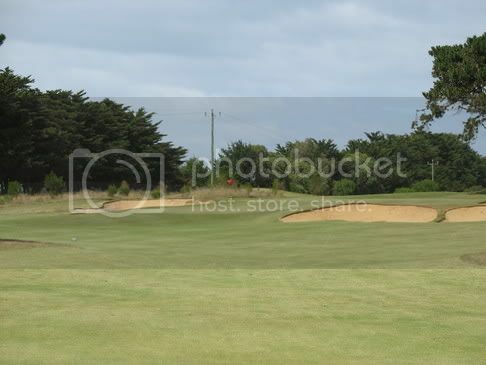 It is still generously wide and accommodating, and anything that can make you come unstuck on this hole can be foreseen before playing, so the golfer has nobody to blame for their calamity but themselves. I think it is a fantastic hole, one of the best on the Creek course. The trees frame an otherwise boring hole. Hello ttitheridge, from deepest China! 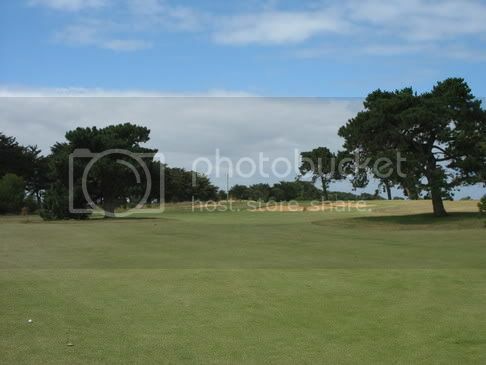 two – originally there was 60 metre wide fairway defined to the right side if the right hand tree, terminating in a built ridge at 235 metres to stop any drive at that distance. The idea was that anyone would drive out right, unencumbered by the trees at all, but the drive length would be truncated, and the longer approach into the diagonal green would be strongly examined by the deep greenside bunkers. 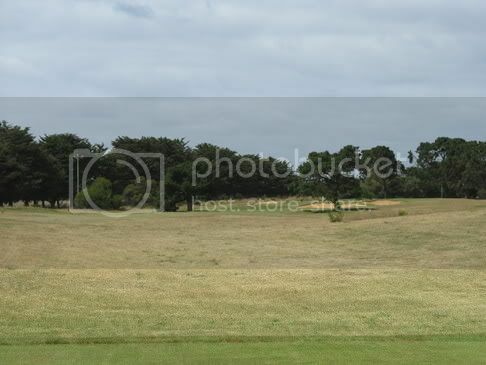 The right side fairway was jettisoned for budget reasons, but the entire fairway width was intended to be 130 metres, with two linear soft spurs aimed at the two trees dividing that vast expanse into three. The green was then designed to reward approaches from the left-side ‘leg’, which is the most dangerous because of the out-of-bounds fence (but there’s actually about 35 metres out there, please note), and progressively more difficult for the middle option, and then as noted the (original) wide right one. the two trees, to allow a clear shot into th green, or to lay up well short of them to have space to play over them if your aim was a bit away. So it’s a fascinating strategic hole, this little 13th, and gives the lie to those who think everything must be laid out clearly, unimpeded visually – the ‘ordinary’, the banal. Yes, two bunkers would have achieved much of what’s there, but why not use the canvas given to you? never played it but just looking at the pictures i'd agree with the above statement. I think this hole is great. I get to play there quite a bit as I live 15 minutes from there. The two trees make you think about your tee shots and where you need to place your ball to have a shot into the green. Being a shortish hole the easy option would be to hit driver then a small wedge, 2 putt and walk of with a par. With the trees being where they are, in my opinion takes the driver out of the question. If you miss your target line then you may end up under or behind one of those trees and then, with such a tight green you have just put more pressure on yourself which could have been avoided. I've never hit driver of this one. I'll hit a 3 wood and if I miss where I wanted to hit it, I'm short of the trees and can easily hit a wedge over them into the green. Thats the plan anyway. A great hole to think about rather than going straight for the driver. Trees can definitely dictate a hole and make it spectacular. Look at 18 at Pebble for example. Those two trees completely dictate the play off the tee, and yet it's one of the most famous and best finishing holes in golf. Without them, the fairway would be ridiculously wide and play a lot easier. Trees in the fairway can dictate a hole and make it a great one - requires strategy and careful placement rather than belting it with driver. I've played 13th beach a number of times and think that 13 is one of the best holes on either course. If you try to play aggressive by hitting driver and slightly miss your target, you get penalised by being blocked out for your second, but alsothe chance of hitting a good drive and getting rewarded by having a wedge in. Lay it back with 3 wood and the room for error is greater, but you have a mid iron in which to that green becomes a tough shot. A crucial feature of a great risk reward hole.